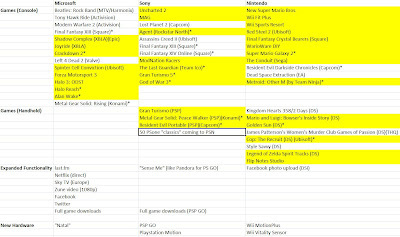 --games in yellow are exclusives. --games with an * are not coming out until 2010 or later. Sorry that I can't make that large enough to read without clicking on the image (which means you may need to follow along in a separate window), but there was just too much information to include. And I apologize in advance for whatever I've left out, because I'm sure there's something. Now that we see the big picture at a glance, let's dig in deeper. First off, both Microsoft and Sony now have their own motion sensing hardware. Natal (Microsoft) seems to be fairly early in development and uses cameras to detect motion (no controller at all). Playstation Motion uses a controller and a camera, and seems to be much further along. Both of these devices have the same problem--gaining developer support to become more than a niche product. Motion control took off for Nintendo because Wii Sports was absolutely the perfect demonstration of the technology. Perfect. And both the controller and the demonstration program shipped with every Wii. Microsoft and Sony are in a far different position, and it remains to be seen whether either piece of hardware will gain traction. Nintendo also seems to be in better position with regards to Wii MotionPlus, because multiple developers have both announced support and bundled the controller add-on with upcoming games. Second, everyone seems to be standing pat on price, at least for now. Sony actually did well in terms of their presentation, but they cut themselves off at the knees (again!) in terms of price. The PSP GO is launching at $249, almost 50% more than the cost of the Nintendo DSi. Damn, have you Sony executives learned NOTHING? There was also no announcement of a price reduction for the PS3, so maybe we do have a chance of a $100 reduction being announced in September (which might still allow them to hit their target of 30% growth). But without a price reduction, the game announcements didn't have the impact they could have. Sony acts like a character in a Charlotte Brontë novel--they seem to think they have an entire lifetime to seize the moment. Third, on the console side, it's amazing how thin both Microsoft and Sony are in terms of first-party exclusives shipping this year. Microsoft has Forza 3 and Halo: ODST. Sony has Uncharted 2: Among Thieves and possibly MAG (although I'll be surprised if MAG actually ships this year). And while Nintendo has more titles, I'm not sure they're really doing any better. Wii Fit Plus will print money, but in a gaming sense, none of us care. WarioWare DIY is an interesting idea, but it's more of a tookit, seemingly. So really, we're left with New Super Mario Bros. and Wii Sports Resort. In total, that's all kind of depressing. Microsoft's clear advantage this year was the social networking space, as well as significantly improving their video on demand options. Sony has talked about making Home into a social hub, but really, Microsoft is the company actually doing that. Microsoft also did an excellent job of parrying. The two biggest exclusive third-party franchises on the PS3 (Final Fantasy series and Metal Gear Solid) are no longer exclusive (Final Fantasy had been previously announced). They countered the motion-sensing controller of the Wii (although it looks a long way from being available). As far as Sony and Nintendo, they both generated a degree of excitement, but they didn't touch all the bases as well as Microsoft did. This is running long and I'm really beat, so I'm stopping here.